At Prasanna Purple, applicants are considered for employment solely on the basis of their qualifications and competency. As an employee you will enjoy equal opportunity in all aspects of employment, including recruitment, training conditions of service and career progression. We are committed to maintaining a workplace where each employee's privacy and personal dignity is respected and protected. There's more to us than meets the eye! People from diverse backgrounds and geographies have come together in pursuit of a common vision. •	Our corporate culture is open and inclusive; irrespective of your experience, you will immediately be welcomed into the team, and will always have a significant role to play. Intense training and development programs facilitate on-the-job learning. Our mentor programs foster supportive relationships that help develop skills, behaviour, and insights to enable you to attain your goals. When you join, you will be introduced to the company, its processes, tools and procedures, and you will be personally guided along the way. In fact, even while you are in the process of applying, you will be assigned a representative to help you through the process. 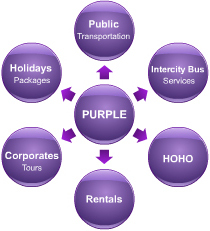 We at PURPLE, focus on the human capital and human relation issues to develop the potential required to establish the key strengths of the business that embarks the sustained growth and community development. The Company is on the path of forging economic development of the country through its contribution to the Mobility sector. With dedication and firm commitment, we aspire to embrace the future and build a better tomorrow. We are one of the pioneers of this domain and have a passion for excellence and never failing commitment towards our customers, employees, stakeholders and the community at large. Develop relationships that celebrate diverse ideas, perspectives and cultures. Help people realize their potential. Support a balance between family and work life. Recognize and reward individual and team achievement. Provide appropriate working conditions and resources to enable people to do their work. Respect and be sensitive to the needs of individuals when the employment relationship ends. Building a high performance culture.